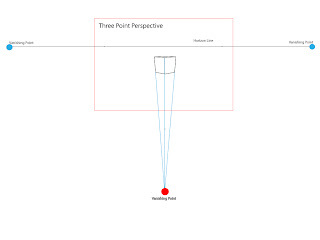 After reviewing one point and two point perspective we can now look at three point perspective. Today we use a box drawn in three point perspective to better understand how to construct a scene using three point perspective. 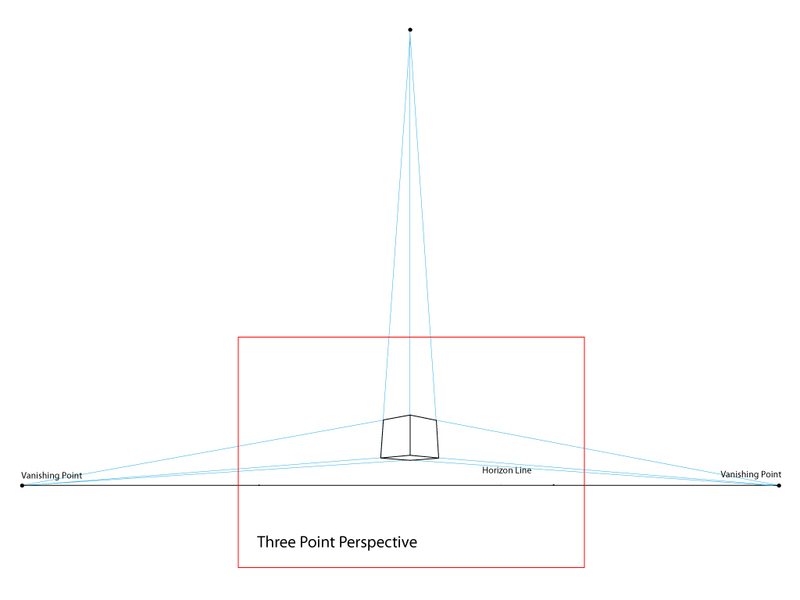 Three point perspective builds on the concepts of two point perspective. 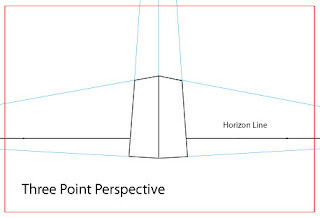 There are still two vanishing points along the horizon line and the orthogonal lines still help determine the shape the surfaces of the object make as seen in perspective. 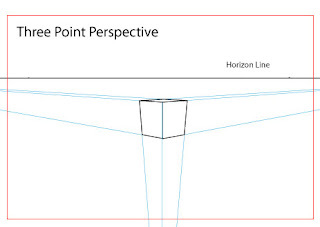 As the name suggests, three point perspective adds just one more vanishing point as reference. 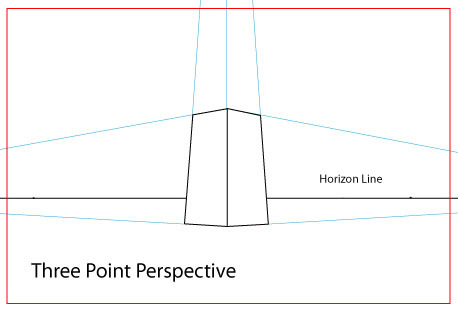 This vanishing point will be either above or below the scene. 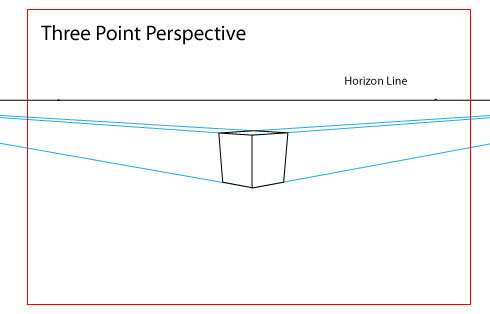 The new vanishing point is illustrated as the red dot below the box in this image. 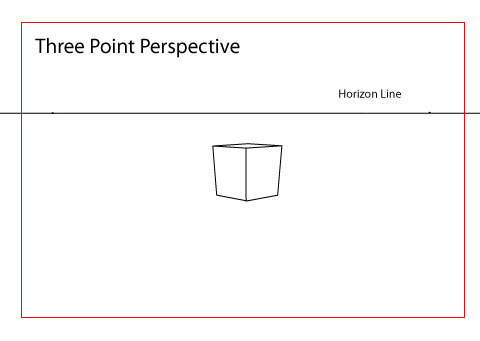 Starting with the box we can see the cube looks a little distorted as compared to two point perspective. 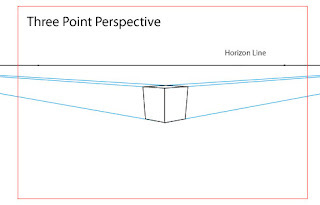 This is because our view is now looking down on the box and not at the horizon line. 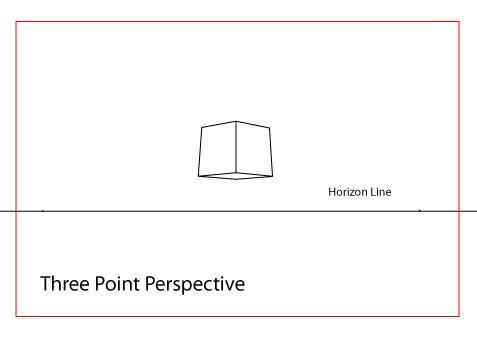 When we add the orthogonal lines that we are familiar with from two point perspective we can see that three point perspective starts out in the same manner as two point perspective. 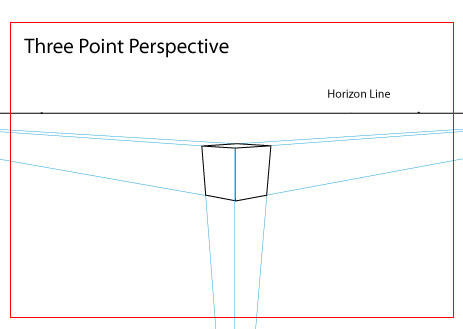 The top and bottom edges of the box are still determined by these lines that run back to the vanishing points on the horizon line. 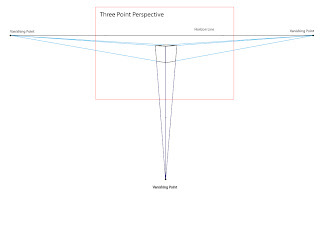 This image illustrates the vanishing points outside of the view frame. The image to the right includes the orthogonal lines going to the third vanishing point below. In this case, this would be good for looking down at an object. These lines help determine the side edges of the box. Notice how they pinch in from the top to the bottom of the box. 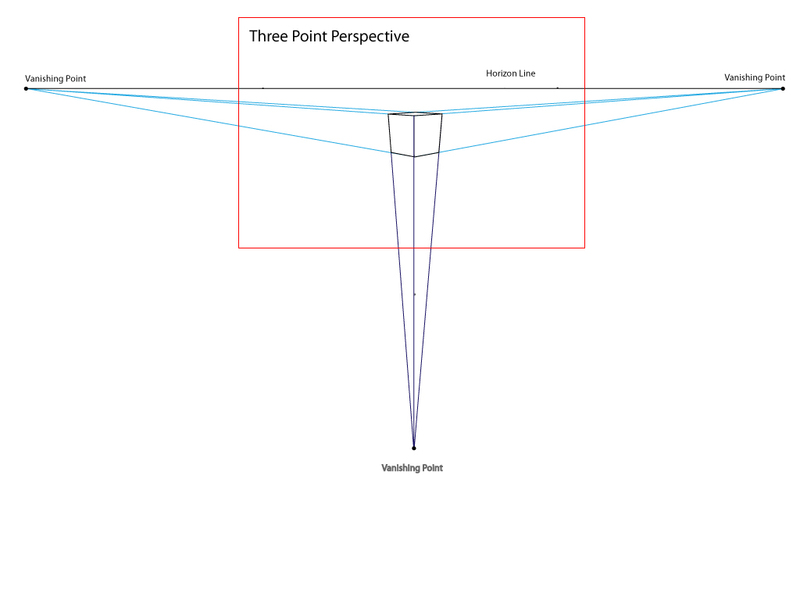 This is the effect of the third vanishing point. 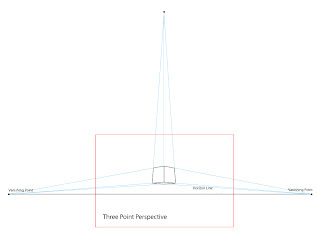 The third vanishing point does not necessarily fall below the object. We can place it above it the scene as well. We would do this when drawing a scene were we are looking up at an object. 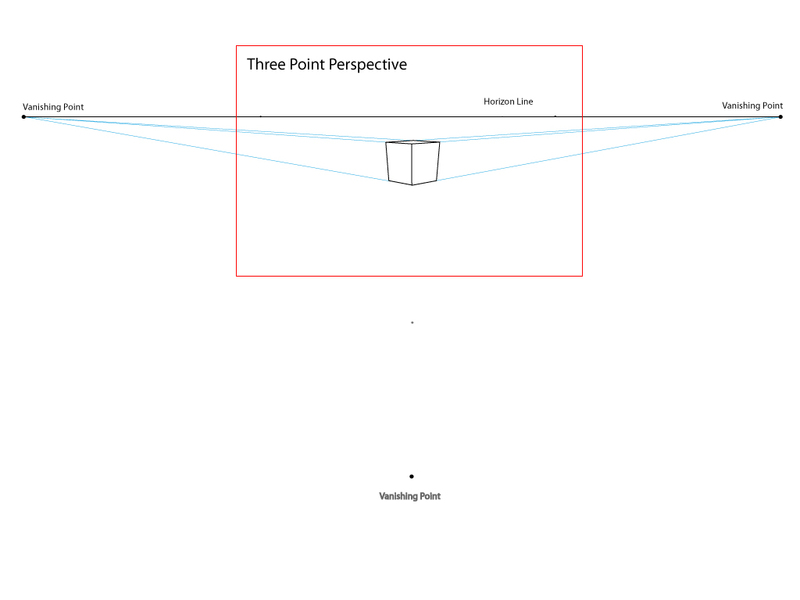 Just like when the third vanishing point was below the scene the orthogonal lines determine the side edges of the box. 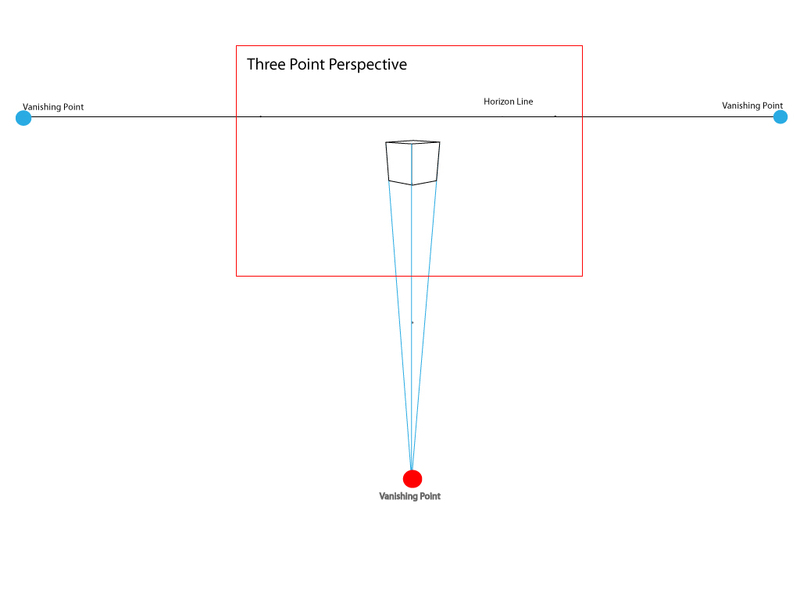 Three point perspective is one more tool to use in creating both depth and setting up the view point of a scene. For example, it would be useful for drawing a cityscape scene where the view point is looking up at a building or buildings. 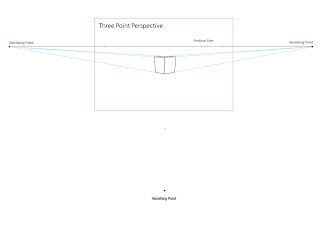 It is also useful for looking down on a scene, say looking down at roof tops from a tall building.